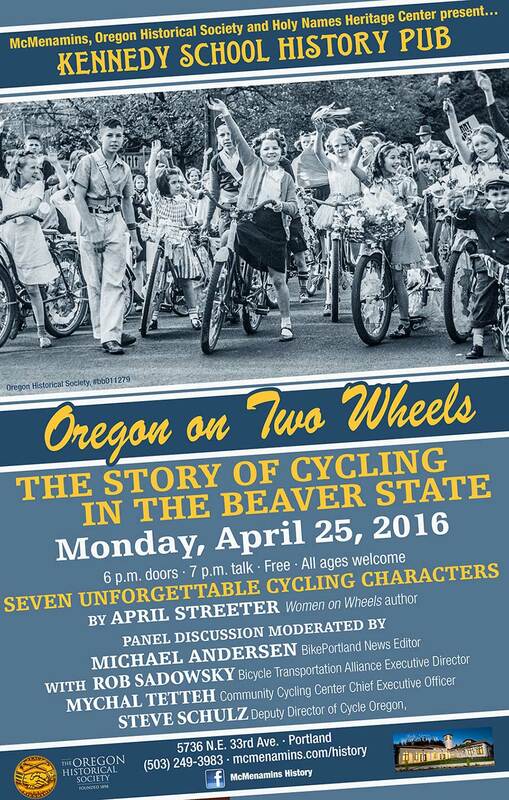 Oregon on Two Wheels: The Story of Cycling in the Beaver State is the theme of the latest History Pub at the Kennedy School (5736 NE 33rd), on Monday, 25 April 2016. April Streeter will present seven “unforgettable characters who have shaped Portland’s bike culture,” going back to the 1800s. A special panel discussion follows moderated by Michael Andersen, BikePortland News Editor, Rob Sadowsky, Bicycle Transportation Alliance Executive Director, and Mychal Tetteh, Community Cycling Center Chief Executive Officer. In their discussion they will explore the dynamic history and unique culture of cycling in Oregon.